Ok I know that’s rather stating the obvious, but I do have a boy boy on my hands. You see Oli has discovered that he is a boy and can often be found with one hand down his pants nappy playing with his ‘tinky winky’ and the fingers of the other hand up his nose. It’s not just that though he’s also discovered the art of ‘scab picking’ so when he’s fallen over and scarped his legs/arms, and it starts to scab over, he picks it! I didn’t think I would have to deal with this kind of things for at least another couple of years. 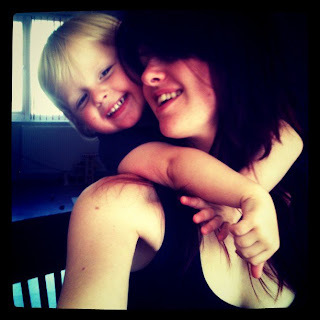 Apart from grossing me out though I’m so proud of the little boy my toddler is turning into! He’s changing every day, only the other day he climbed up on the chair behind me and gave me the most adorable cuddle. He even happily stayed there while I captured the moment on camera. Next Post What Not To Do When Your Electricity Goes..